Architects and engineers at Dallas’ Lane, Gamble & Associates spent three years planning the project. It included office buildings, shops and services, two department stores, a hotel, and residential towers. The press labeled the development a “city-within-a-city” and the “city of tomorrow.” The development was never fully built, but the part that was constructed was ahead of its time and set trends for similar development across the country. The 14-story Exchange Bank opened in 1956 with a clean-line modern design that featured continuous strips of windows with bright yellow spandrels, since painted a charcoal gray. Projecting sun visors, a new concept, were built into the facade to cut down on the heat load by keeping sun off the windows. The interior was just as cutting edge, with movable wall partitions that could be rearranged overnight to create new office spaces. Innovations included snap-in air outlets and light fixtures as well as floor construction that allowed wiring and outlets to be easily rearranged to meet tenant requirements. 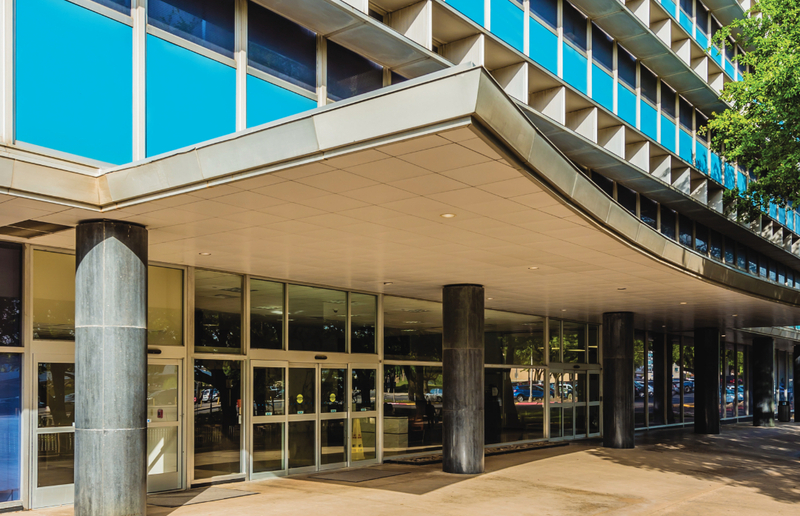 According to The Dallas Morning News, Exchange Bank was the first U.S. office building to incorporate such modular flexibility. The Braniff Airways headquarters, the site’s second office tower, opened in 1958. The 10-story building was strikingly similar to Exchange Bank and used the same sun visors on the main façade. 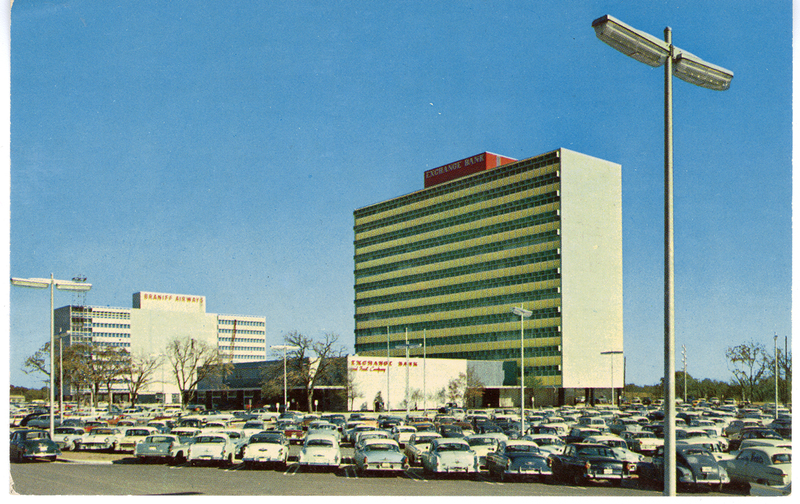 But the Braniff building had bright blue spandrels, which still retain their original color, a rear façade with a different shading system and a top floor that featured a landscaped terrace that gave Braniff executives views of nearby Love Field. The interior featured the same flexible wall system. Connecting the two towers were 40-foot-wide “weather-conditioned streets.” The fully enclosed, air-conditioned area contained shops, services, and restaurants. 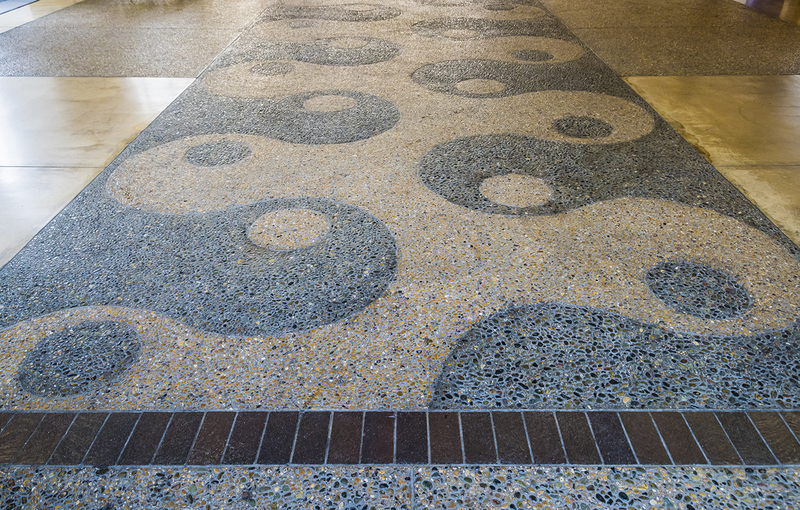 The “street” had a mix of brick and exposed concrete, with designs scattered throughout in patterns of varying shades and sizes of exposed aggregate. Above, a series of large skylights provided natural light for the space, including planters with lush foliage. 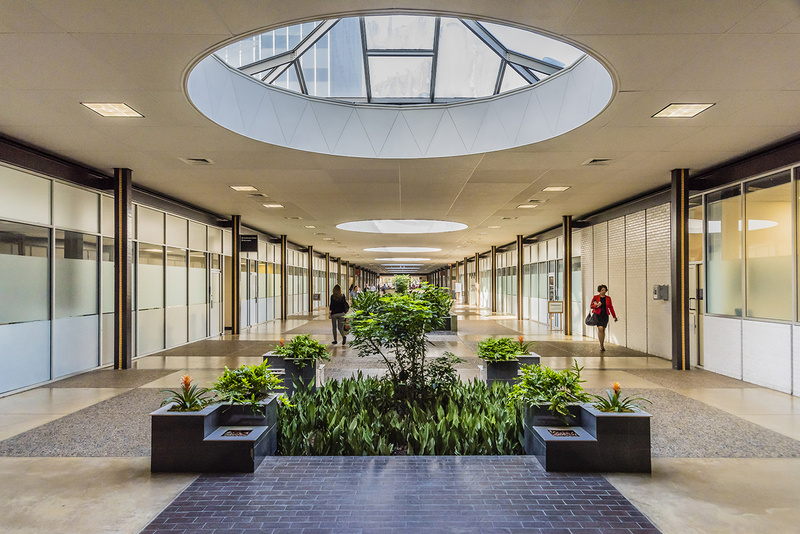 The concept served as a forerunner to the modern mall. The Mickey Mantle Bowling Center, also opened in 1959, featured 32 lanes, and the baseball great moved his family to Dallas to be near the new center. Over 10,000 people, including Whitey Ford, Yogi Berra, Billy Martin, and Dorothy Malone, came for the opening. A garage and surface lots provided ample parking. Underneath the complex, a 3,600-foot-long tunnel system allowed trucks to unload and service vehicles to operate without being seen or interfering with traffic movement at ground level. The third and final office tower at Exchange Park opened in 1966 as the corporate home of Frito-Lay. Lane, Gamble & Associates departed from the design of the earlier towers, forgoing sun visors for a clean glass-walled cube of 17 stories with a five-story projection. The building featured a private rooftop club, a medieval pub, and a large cafeteria. 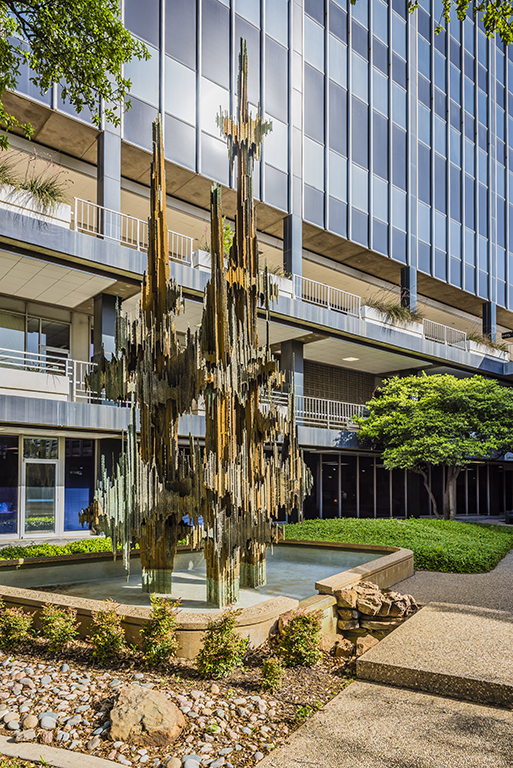 It also included an elaborately landscaped garden area with a 5-ton copper water sculpture by Wilbert Verhelst. The tower connected to the pedestrian mall and the parking garage, which was expanded to accommodate the new tenant. Today, Exchange Park remains close to its original design, with slight updates for modern conveniences. But its use has changed dramatically. Braniff moved its headquarters to DFW International Airport in 1976, and Frito-Lay left for Plano in 1985. Exchange Bank was bought out and became Texas American Bank before it closed. 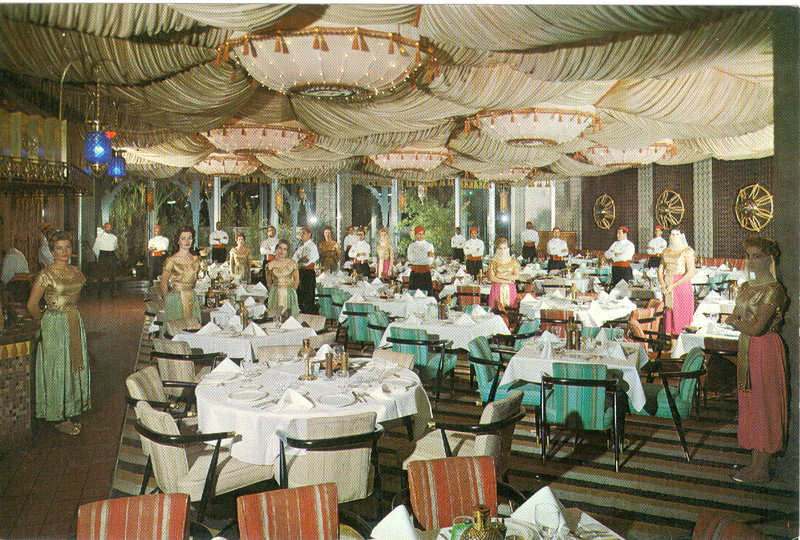 Arthur’s West restaurant replaced La Tunisia in 1972, and it, too, eventually closed. The Mickey Mantle Bowling Center is long gone. 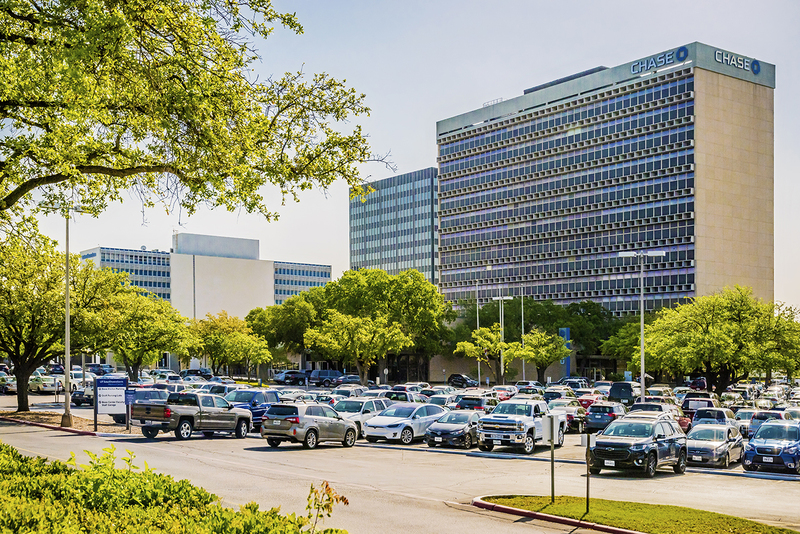 Exchange Park changed hands several times, and in 2008 UT Southwestern Medical Center purchased a large portion of the complex to expand its campus. Today the complex is mostly medical in nature, with offices for UT Southwestern Medical School and Parkland Memorial Hospital. J.P. Morgan Chase has taken over Exchange Bank’s lobby and motor bank. Medical offices and a food court replaced the mall, but the original skylights and street of brick and concrete remain. When Exchange Park opened, it was cutting edge for its mixed-use concept of office and retail and the architectural design with its sun shading system and modular office flexibility. In 1956, Architectural South magazine heralded Exchange Park as “an entirely new concept of the business community of the future — a city within a city, containing all of the facilities necessary to provide goods and services under the most favorable conditions — comfort and convenience without congestion.” While the complex was never completed, what did get built was groundbreaking and served as a model for development across the country.